Click here to buy it (£25 + P&P). 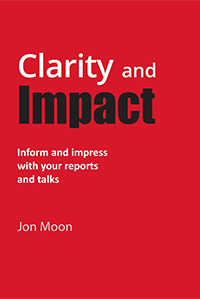 Inform and impress with your reports and talks. About 60 pages is from my first book (but much improved, I add). About 250 pages is new stuff. "Every business professional on this planet needs a copy"
"A must-have book for anyone trying to keep it simple!" "The best book on how to sell your ideas in business"
"Probably the most important (work) book I own"
"A report reference book to rule them all"
"A must, must, must-read book"
"A stunning piece of work"
Here are the full quotes and Amazon reviews. Tired of business books that stretch a single idea to 300 pages? Fear not. You'll be bowled over by how much you get from this one. In fact, think of it not as one book, but three: (1) writing; (2) presenting; (3) numbers, i.e. graphs, tables, KPIs. A total of 34 Chapters (I list them further below) - and they're like liquorice allsorts: every one will be someone's favourite. "Graphs, tables, numbers. Variances, RAGs, KPIs, dashboards. WiT and bullets (but much more than before). Visuals, photos. Design, layout. Words to use. And avoid. Informing, summarising, persuading. Talks to bosses. Lunch-and-learns, conference speeches, training events. Writing speeches in minutes, not hours. Handouts, slides. Flowcharts, heat maps. Story-telling, infographics (when to use; when not to). Team writing. Advanced writing. Sales pitches. Decks. Explaining complexity. Audit reports, manuals (how-to and compliance). Project updates, staff surveys. Waterfalls, isobars. Presenting. Answering questions, dealing with nerves. And so on." You'll never look at a document - or listen to a talk - in the same way. And your work will be better than you ever thought possible. It's the best money you’ll ever spend to further your career. There's a huge amount in it. And a huge amount on each page. Result: not all will be relevant to you. No worries though - enjoy the bits that are. Also, you won't breeze through it all in an hour and emerge transformed. OK, some ideas quickly help, but this book isn't a content-thin quick fix. Rather, it's a proper look at the topic of clarity. That's 34 Chapters. And hardly a computing tip in sight (they're on my downloads page - and are free). This Part is relevant to almost everyone, and nearly all of it helps both reports and talks. The first six Chapters (57 pages) are almost all from my first book. WiT (12). My alternative to bullets. It gives readers choice. It sharpens writers' thinking. It helps points pop from the page. Graphs (12). A look at popular graphs. Some new graphs to try. And four questions to ask before you do a graph. Numbers (5). How to ensure numbers clarify, don't confuse. Tables (17). Five steps to do tables that people love, not loathe. Includes a great final Big Redo that goes beyond my first book. Making comparisons (5). You won't ever do a list of pros and cons again. Design (6). Typography and design tips to ensure your work looks sharp. Words for talks and reports (4). Which words to use? Which to avoid? Four pages that punch way above their weight. What people need - myths (12). Why it's good sometimes to be random. Negative. And more. Also, discover how to write great speeches in minutes, not hours. Achieving outcomes (15). Why your work needs ‘repeatability’ (it’s more than being memorable). A hugely important Chapter. Your first 30 seconds (13) – for both reports and talks. Want to spend less time in meetings? This Chapter is for you. Words - specific to writing (11). Worried that your words just don't seem to get through to your readers? Read this Chapter - all is revealed. Getting to the nub (6). Ever struggled to get to the heart of what you wish to convey? Struggle no more. Another hugely important Chapter. Visuals and photos (8). When they work – and how to do them – and when they don’t. Infographics (7); Story-Telling (8). Learn the truth about these two hot topics. Both Chapters overflow with irony. More on WiT (3 Chapters - 18 pages in total). New WiT layouts. Problems putting WiT into practice. Common mistakes people make with WiT. FAQs. Formatting tips. Together, these Chapters get your WiT from great to fantastic. Big reports (17). Tips on team-writing, multiple-editing, order (what's the best order for big reports? ), and more. You also see how to slash the size of many reports. Writing - advanced (9). Editing tips to help you comply with word or page-limits. And why rhythm isn’t just for poets and musicians. Technical writing; jargon (9). Why jargon is great. And learn how to make the complex seem simple - explain stuff in ways that others instantly grasp. Specific reports (11). Tips on manuals (compliance and how-to manuals). Written pitches. Plans (business, marketing, etc). Training outlines. Decks (11). (Or slide packs.) They’re reports written in PowerPoint, then emailed for people to read at their desk. This Chapter lifts the lid on them, plus tells you how to make yours great. Introduction (3). Some background, e.g. why my book ignores speeches by Steve Jobs and JFK. Slides (4). What should you put on a slide when presenting a report to others? This Chapter reveals all. The Slide Rule (9). A great way to save your and your delegates’ time. You look good too. Coherence, themes (5). Ever struggled to give coherence to your isolated ideas? To give a bit of levity to your lunch-and-learn? Struggle no more. Handouts (4). How many handouts do you look at? Do handouts that people admire, keep and refer to. Presenting (8). Preparing. Delivering. Questions and answers. Uninterested people. Nerves. After the talk. It pops myths too (e.g. "93% of impact comes not from what we say but how we say it”). Graphs - more (17). Scattergrams, histograms, waterfalls (including my new-look waterfall), when columns work, some new graphs, and the graph that changed my career. Signalling performance (15). RAGs, smiley faces, Harvey Balls, heat maps, and much more. Other diagrams (11). Flowcharts, org charts, decision trees (this last one is a favourite topic of mine). KPI packs (and variances) (16). Read this and people will congratulate you on your one-page KPI report. All bar one page is completely new material. Finally, my favourites (1). My five favourite bits of the book. Appendix: colour (2). Even though it's a black-and-white book, here's two pages on the topic. Any of the following words or phrases (other than to mock them): innovative. Stakeholder(s). The pace of change is quickening. Framework. Managers are short of time. Solutions. The only constant is change. Big data. Footprint. Reach out. Paradigm. Digitisation has changed everything. Unique. Etc. "I was drawn into Jon's book... My wife went into labour with our son, and the book was the first thing I packed into her bag. I sat in the corner of the delivery room, not able to tear myself away from the WiT approach, the book's underlying main philosophy. My son arrived safe and well, unaware of his father's distraction, but he is making up for it now"
I've never met Phil but he has a certain style. "Deserves a place among the business writing classics"
"Excellent - has the potential to re-write the rules"
"One of the best investments I’ve ever made"
"Cannot recommend it highly enough"
"I wish I read this 20 years ago"
"The best business book ever?" "Pure and simple.. but brilliant"
"I have recommended this book to everybody from my teenage daughter through to my great uncle who retired some time ago but still produces a newsletter for his local church"